Tip: If BBC Phones, Get Your Knickers On Quick! I shared this story last week with my specialist RenewYou trainers on our specialist web site. They liked it; I hope you do too. Last week I was woken by the insistent ringing of my mobile at 7 am. My alarm was set for 7.15 but I was deeply asleep. I leapt out of bed, fearing it was my mum who’d had a fall or something and the alarm care people were calling me. ‘Yes‘, I rushed into the mouthpiece, ‘Jane Woods here’. It’s now 7.02am and I am beginning to wake up and realise that this is nothing to do with Mum at all. Ten minutes! What should I do? Get dressed? Research the ghastly Julien Blanc? Do I remember what he said that incensed me so? (I do, as it happens). Have tea? I settle on going to the loo, wrapping my dressing gown tightly around me and going into the office. After a few moments the office phone rings. “Jane, I’m just going to put you through and you’ll be talking with Penny and Paul.” Oh, I think, a few words with them off air to brief me. Good. And that was it, I was on. I can’t even tell you for how long. I think I made some reasonable points but just to be sure I’ve blogged on my views too. Certainly, if I’d had more time to think I might have been more erudite, but there you go. There was no time to think or even to get dressed. So, my advice is, always be prepared, and get your knickers on as fast as possible as it makes you feel more professional! I got off the phone, skipped out of the office downstairs, and danced around the kitchen, much to the amusement of my husband. ‘I do believe you’re happier about this than you were about going to Graceland’ he said, wryly. Err, YES! 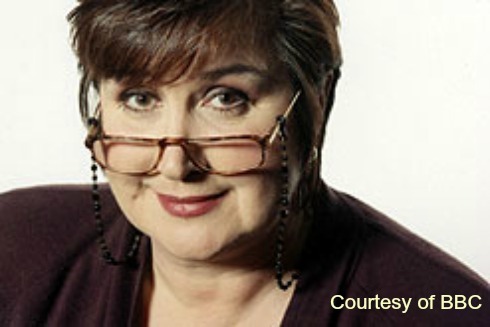 It’s Dame Jenni Murray! This is great and reminds me of doing a live piece about flooding on R5 kneeling on my bed with wet hair and dryer at the ready as soon as the interview was over! Thanks for sharing Jane. Ten minutes is very short, I have always had a few hours notice. Just sufficient to Google the item in the news, and come up with some sort of coherent view. Always say yes. Do agree. What a great story Jane, and looking forward to hearing you on R4 this Friday. Your story made me chuckle! Another tip – be ready for them to phone you and say “we don’t need you after all!” Been on BBC Breakfast a couple of times live and pre record, Radio 5 and regional stations. Been ‘phoned another couple of time by BBC who said they wanted me then get back and say “not this time”. Must have said something wrong on the telephone (I think mentioning someone else’s website as good was possibly a no no?!) and the latest was for a pre record and they couldn’t find a film crew to get to me (and I’m London!) You live and learn. Once did a phone in for a radio station given half hour’s notice, I’d already started on the wine… Luckily I think it went ok! Ha ha. The wine may have improved it! Yes, I’ve had the ‘we don’t need you thing’ and was half expecting this time when P.D.James death was announced, as she was a Woman’s Hour regular. I am very grateful to local BBC Radio Bristol for ‘teaching’ me how it works. Let us know when you’re next on!